We are experts in risk, strategy and people – and a strategic partner in promoting growth, protecting value and helping clients make better decisions. Our colleagues at Marsh, Guy Carpenter, Mercer and Oliver Wyman are known for character, commitment to their clients' enterprise and the temperament to overcome challenges. Together, we combine a unique range of capabilities to help our clients solve problems, seize opportunities and build lasting success in increasingly dynamic operating environments. Each of our companies is a market leader in intellectual capital and operational capabilities for clients. Our Strategic Solutions Group brings these capabilities together in a coordinated approach to interrelated challenges. Today’s complex business environment presents extraordinary challenges to business leaders. The risk, strategy and people aspects of these issues are increasingly intertwined. We bring together teams from Marsh, Guy Capenter, Mercer and Oliver Wyman to partner with clients to address their complex challenges in a holistic, coordinated and effective way. 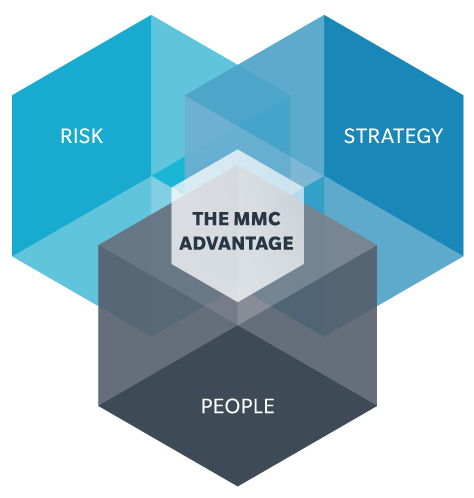 Our approach is unique — we call it the MMC Advantage. To start a conversation, click here. We enable enterprise in more than 130 countries, helping our clients address the great challenges and opportunities of our time. Business resilience specialists at Marsh are helping multinational organizations manage the risks of political instability in emerging markets with multi-faceted strategies to protect their people, assets and supply chains. Guy Carpenter is helping insurers and governments understand the risks they face and spread their related costs into broader financial markets. Now perils such as rising seas can be better managed for the benefit of communities and businesses. Mercer is helping institutional investors assess the impact of climate change scenarios on their portfolios. As a result, asset managers are engaging with climate issues as never before and increasing their oversight of these emerging risks. Oliver Wyman and behavioral economists at ideas42 are designing new banking products that improve financial stability for the one-third of Americans who live paycheck to paycheck, and generate enough profit to bring banks into the market. Marsh & McLennan Companies helps clients manage the world’s most important resource, people, by improving healthcare outcomes and long-term financial security. Mercer Marsh Benefits is enhancing economic security for millions of Asian workers by equipping employers with better ways to forecast what people will need, ensuring a more bankable future for companies as well as employees. Longevity risk experts at Guy Carpenter are helping employers, policy makers and insurers understand how longer lives will change the economics of working, retiring and healthcare, so the systems we all count on will keep up with us. Pharmacy specialists at Mercer are helping rein in costs of specialty medications, which have nearly doubled since 2011. The Mercer solution provides price stability for benefit managers and peace of mind for employee families. Oliver Wyman is helping policy makers and practitioners tackle chronic population health challenges such as obesity and diabetes by deploying more comprehensive, evidence-based strategies that empower patients. Marsh & McLennan Companies helps clients identify increasingly interconnected risks and implement enterprise solutions to make technology secure and productive. Marsh is pushing governments to survey more of the world’s oceans to make navigation safer for today’s megaships – and prevent environmental harm should one of these huge vessels strike an uncharted reef. Aviation and technology specialists at Guy Carpenter are helping regulators, insurers and businesses balance the phenomenal economic potential of pilotless aircraft with potential risks to public safety, privacy and national security. A Mercer app is using neuroscience to help employers find untapped talent. Twelve short games assess 80 cognitive, emotional and social traits, matching candidates with roles where they will truly thrive. Oliver Wyman is helping industrial clients see their operating environments in new ways by linking drone-mounted sensors to advanced analytics, turning right now data into right now decisions. Marsh & McLennan Companies collaborates with global industries, NGOs and governments to identify shared risks, preserve critical resources and advise on long-term investments. By applying advanced analytics to extreme weather events, the Catastrophe Response Team at Marsh is helping businesses, communities and insurers prepare and respond more effectively when nature does its worst. A one-of-a-kind database at Guy Carpenter is helping clients model an expanding range of environmental liabilities, enabling more comprehensive risk assessment – and fuller recovery when prevention fails. Retirement specialists at Mercer are helping clients address a global pensions shortfall. Public, private and individual retirement programs are all underfunded – a growing danger to families, economies and the world financial system. Retail experts at Oliver Wyman are helping to increase global food security by reducing spoilage and waste at stores – a sustainable solution in a world where food production already consumes 50% of the arable land and 70% of its water. THIS IS WHAT WE EXPECT FROM OURSELVES. A single code of conduct governs how nearly 65,000 of us behave wherever we do business. Its title sums up what we’re striving for: The Greater Good. We invite you to read it.